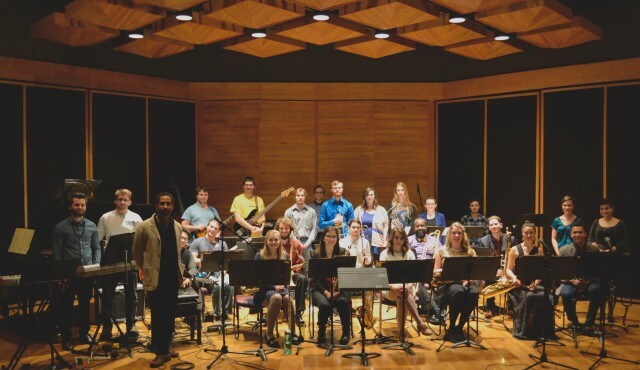 The Brandon University Big Band is heading for a five-day residency in Las Vegas. Michael Cain’s new album is receiving rave reviews from jazz listeners across North America. “Sola” features tracks that were produced in two different places — New York and Las Vegas — with two different sets of musicians, but still manages to be a cohesive whole, held together by Cain’s unique blend of jazz with elements of hip hop and EDM. “An album that captivates the listener with deep grooves, inherent musicality and a palpable sense of equanimity,” says the Huffington Post, which named it one of their Best of Jazz albums in 2015. “With an imaginative mind and worldly experience, fresh and appealing ideas can still be mined within the realm of fusion jazz. Michael Cain’s Sola attests mightily to that notion,” writes Something Else! Magazine. Sola is available now on iTunes and CD Baby. In a city where some of the world’s biggest stars draw huge audiences night after night, a group of Brandon University (BU) music students are taking up a five-day residency. The BU Big Band will be playing downtown Las Vegas later this month, as the high-energy jazz ensemble meets with younger Las Vegas students at both a prestigious high school, the Las Vegas Arts Academy, and a creativity-based preschool and primary school, the 9th Bridge School. Together, they’ll perform at multiple events, including a large concert at Las Vegas’ noted Container Park. Lauren Teterenko, a fourth-year jazz saxophone performance major, says it’s by far the biggest trip they’ve done in her four years as part of the Big Band. She says fundraising for the trip has included raffles, canteen proceeds and making and selling lunches to fellow students on campus. Bandmate Stormy Allen, a fourth-year Jazz Studies student who pays trombone, has been making some of those fundraising lunches. “I’ve been cooking up a storm!” he laughs, ticking off everything from shepherd’s pie to perogies and pulled chicken. Also cooking, he says, are the arrangements that they’re preparing to take to Las Vegas, including variations on the Oompa-Loompa theme from Charlie and the Chocolate Factory, and an ABC song. Cain, who grew up in Las Vegas, notes that the city, while known worldwide for gaming, is also a huge arts and music hub, which makes it a great opportunity for BU students. Teterenko says she’s very much looking forward to the trip.